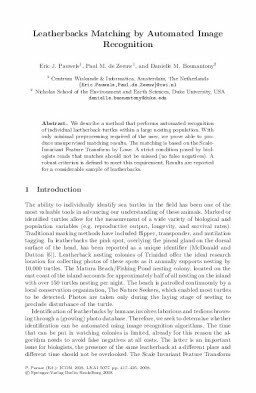 We describe a method that performs automated recognition of individual laetherback turtles within a large nesting population. With only minimal preprocessing required of the user, we prove able to produce unsupervised matching results. The matching is based on the Scale-Invariant Feature Transform by Lowe. A strict condition posed by biologists reads that matches should not be missed (no false negatives). A robust criterion is defined to meet this requirement. Results are reported for a considerable sample of leatherbacks. Pauwels, E.J.E.M, de Zeeuw, P.M, & Buonantony, D.M. (2008). Leatherbacks matching by automated image recognition. In P Perner (Ed. ), Advances in Data Mining - Medical Applications, E-Commerce, Marketing and Theoretical Aspects (pp. 417–425). Springer.